Famous historic haunted castles around the world are favorite places for paranormal enthusiasts and ghost hunters to visit. Learn about the ghosts of famous historical figures seen wandering about these castles along with spooky unexplained paranormal activity. Venture into a great hall or castle tower if you feel brave enough to come face to face with a malevolent spirit. There's a theory amongst parapsychologists that people leave some of their energy behind in the places where they live. This seems especially true when those lives end abruptly, and often violently. A castle that has stood for centuries may collect energy from numerous inhabitants throughout the years. If this theory is true, it's no wonder that paranormal activity is reported at so many castles around the world. 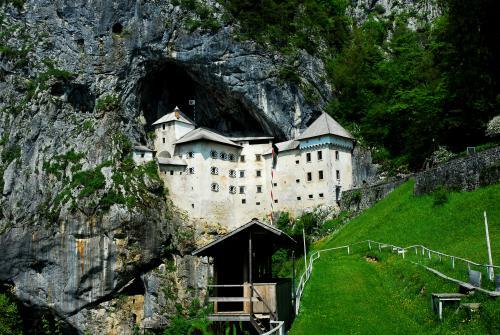 This Slovenian castle is built into a limestone cliff, where it's stood since the 1200s as the family estate of what is called the Slovenian Robin Hood, Knight Ezram Lueger, who stole from the rich - but didn't give it to the poor. Perhaps not surprisingly, it didn't end well for Ezram, who was betrayed by a servant and killed in the castle, which he still reportedly haunts today. 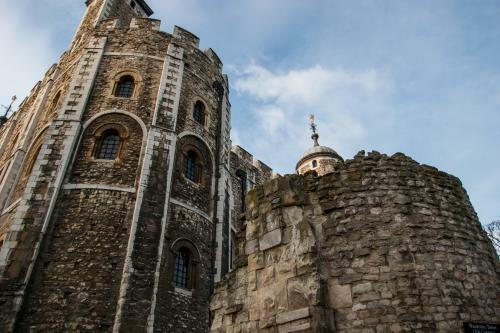 Built in 1078, the Tower of London has been the scene of many triumphs, and perhaps even more tragedies. There are many reports of hauntings at this castle, but a few standout. Anne Boleyn, the second wife of the infamous King Henry VIII, was beheaded at the Tower. She is rumored to appear on the Tower green from time to time. Sightings of the sons of Edward IV, often referred as "the little princes," have been reported over the years. The princes were held captive in the Tower after the death of their father, and later disappeared. It's believed the boys were murdered to secure Richard III's claim on the throne, and the bodies of two boys believed to be the princes were were uncovered during renovations in 1674. This castle is rich in legend. 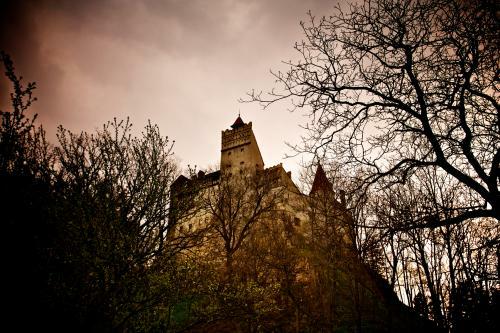 Its actual name is Bran Castle, and it is only one of several residences that belonged to the infamous Vlad Tepes, a Romanian Count renowned for his cunning, as well as his cruelty. Vlad the Impaler, as he came to be known, impaled thousands of his enemies on stakes, leaving them to die slow, torturous deaths. 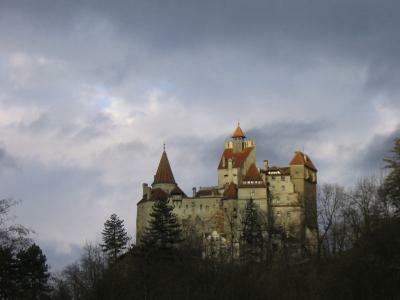 Bran Castle also housed a series of dungeons in its bowels where Vlad reportedly tortured even more of his opponents. In fact, it is this bloody history that inspired Bram Stoker to write his novel, Dracula. The novel's main character is based on Vlad himself, but Stoker took the original legend and embellished it into the quintessential vampire tale, one that still resonates deeply with audiences around the world. Combining the original legend with the literary one, Bran Castle has become known simply as "Dracula's Castle" and it is a major tourist attraction in Transylvania. Perhaps the echoes of so much violence committed within and outside the castle walls taint the fortress' atmosphere, but there is definitely a distinctly eerie feeling to the castle. Many visitors come there with the notion that Vlad may still lurk there himself, hidden away in some secret niche. Medieval Chillingham Castle in Northumberland also appears to have had its share of ghostly encounters over the centuries. Lady Leonora Tankerville occupied the castle during the 1920s and wrote about her encounters there. Among them, she met the dead brother of the man who would soon become her husband, as well as a young soldier friend who visited her upon his demise. A number of supernatural occurrences that have been witnessed over the years. The voices of two men are sometimes heard in the chapel, but they are too muffled for anyone to figure out what they're saying. A frail lady in white supposedly appears in the pantry begging for water. A boy, either dressed in blue or giving off a blue light sometimes appears to visitors. Another presence is felt, but never seen, in another chamber. 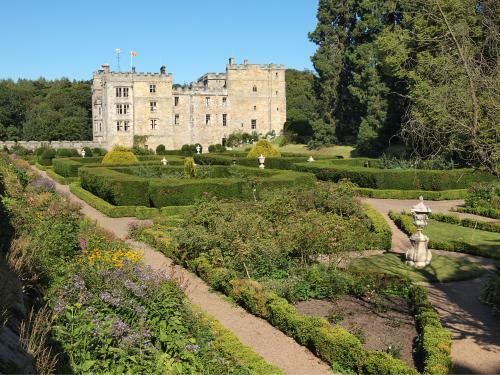 Various other reports from staff and castle visitors continue to pile up, adding to Chillingham's reputation for being one of the most haunted locations in England. It may not look like the stone mammoth castles from Europe, but Himeji Castle is just as haunted as its European counterparts. 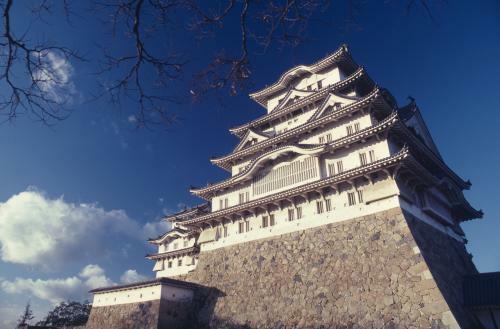 The castle has overlooked the city of Himeji in Japan since the 1300s and in its present form since the 1600s. If you're a movie lover, you might recognize one of Himeji Castle's most well-known stories from the classic horror film The Ring. As the story goes, a samurai fell in love with servant named Okiku, who spurned his advances. The warrior came up with a plan to force her to be with him, but it failed. Spurned again, the samurai threw Okiku down a well at Himeji Castle. Now, her ghost appears on all fours to torment all who visit. Lisheen castle is one of the most famous haunted castles in the country, but there are others worth investigating as well. Located in County Offaly, Charleville Castle looms ominously, surrounded by an old oak forest where druids once practiced their religion. The castle itself is a formidable fortress built in the gothic-revival style by the Earl of Charleville. 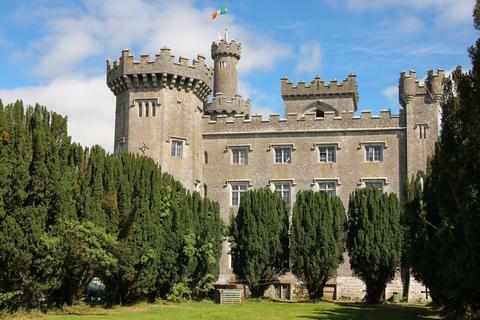 According to the Charleville Castle website, the castle primarily seems to be haunted by the spirit of eight-year-old Harriet, the daughter of the third Earl of Charleville. She died somewhere in the vicinity of the main staircase, but her presence has been felt at various places throughout the castle. People report hearing laughter, screams and even singing. There have also been sightings reported of a golden-haired little girl who wears a blue dress. 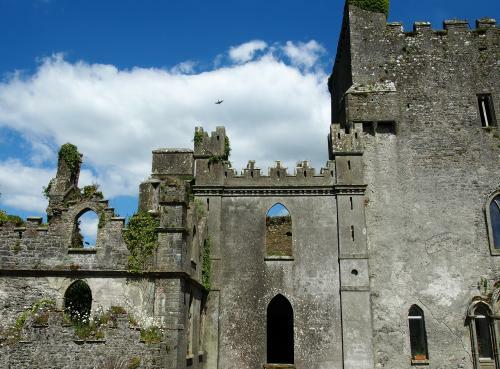 Leap Castle is legendary among haunted castles, and is reportedly the most haunted location in all of Ireland. The history of the haunted castle is steeped in bloody clan warfare. Ghostly tales include the appearance of a monk who was killed by his own brother in what has become known as the "Bloody Chapel." The castle also contains an oubliette, a type of narrow, deep dungeon, which was discovered by laborers working in the castle for a subsequent owner. The dungeon's floor was lined with long spiked poles, and scattered throughout the poles were thousands of human bones. One can only image the pain and terror that accompanied such deaths. Could any of these souls still remain within Leap's walls? The most disturbing paranormal activity surrounds reports of an inhuman phantom often referred to as an it. Such creatures are classed as elemental spirits, and are sometimes considered to be demonic in nature. The it of Leap Castle has been described as vaguely resembling the rotting carcass of a sheep with unsettling, dark human eyes. The smell is said to be overwhelming, but this apparition is also accompanied by strong feelings of menace. There are a few reports that this elemental has attacked people in the past. In fact, such an attack was reported on an episode of Ghost Hunters where one of the investigators appeared to be bowled to the ground by an unseen force in the darkness. Even the United States has its own haunted castles. Perhaps one of the best known, Preston Castle, is in Ione, California. Although no nobility ever lived there, the castle was built around the turn of the 20th Century and served as a reformatory for boys ages 7 and older until 1960. 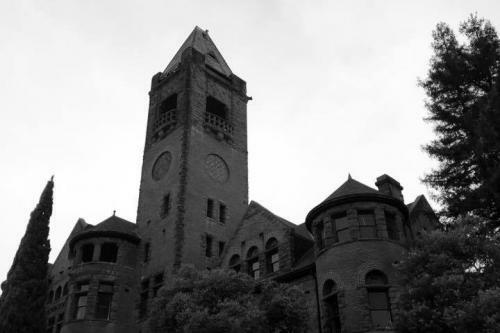 Because of the energy of the inmates, prisons are often haunted, and Preston Castle is no different. Visitors see apparitions, hear doors slam and the sound of footsteps, and some even report being touched by ghosts. You can visit the castle's museum on the first floor, but conditions in the rest of the castle are difficult so other visits must be part of formal tours or events offered by the Preston Castle Foundation. These castles are only a handful among many reported to be haunted. Some are open to the public, while others remain private family homes. Pay a visit to one of these places if you dare and decide for yourself whether it's truly haunted.